regular-service bus fitted with the economical engine generation is ready for collection. Peter Medenbach, Manager, Medenbach Traffic GmbH, and his wife, Dorothee Grebe, received the symbolic key from Rudiger Kappel, Head of Sales for the Mercedes-Benz Bus and Coach Unit. The milestone vehicle is a Citaro LE (Low Entry). It forms part of an order for a total of 20 Citaro LEs and five Citaro G Euro VI buses. "Both our new generation of vehicles and the fuel-efficient BlueEfficiency engines meet our customers' wishes for economy and state-of-the-art technology in ideal fashion. Transport operators wish to and need to operate regular services which are both environment-friendly and make economic sense. 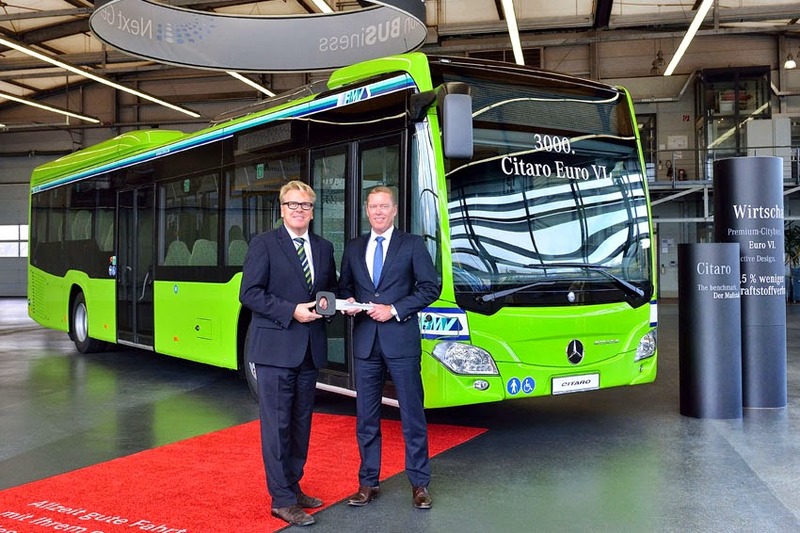 With the Citaro Euro VI modular system we are able to cover virtually all customer requirements in this regard," said Hartmut Schick, Head, Daimler Buses.